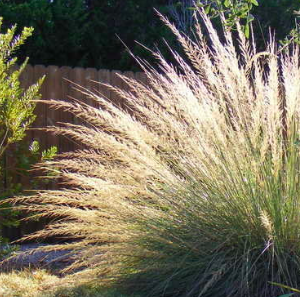 Most grasses in this genus native to North America really do prefer a hotter, longer summer than we have. But this one has surprised us and we are in love with it. Strongly clump forming evergreen grass with thin blue/green blades that rise to about 1′ tall. In late summer spikes erupt and as they unfurl they reveal a long feather like inflorescence that is up to 2′ long. The sun shining through this taupe/white group of flowers is purely luminescent. To 4′ tall and 4′ wide for full sun and average, well drained soil full sun. Excels on slopes- especially hot slopes. It requires just light summer irrigation but established clumps get by with none and still perform. Wonderful grass to plant among such things as Arctostaphylos and Grevilleas. Cut back to the foliage in spring. Really good looking dryland grass from the Texas Big Bend country.